Myrtos beach is that stunning picture post card beach that you’ve seen photographed from the winding roads above dozens of times and probably part of the reason why so many people go to Kefalonia. 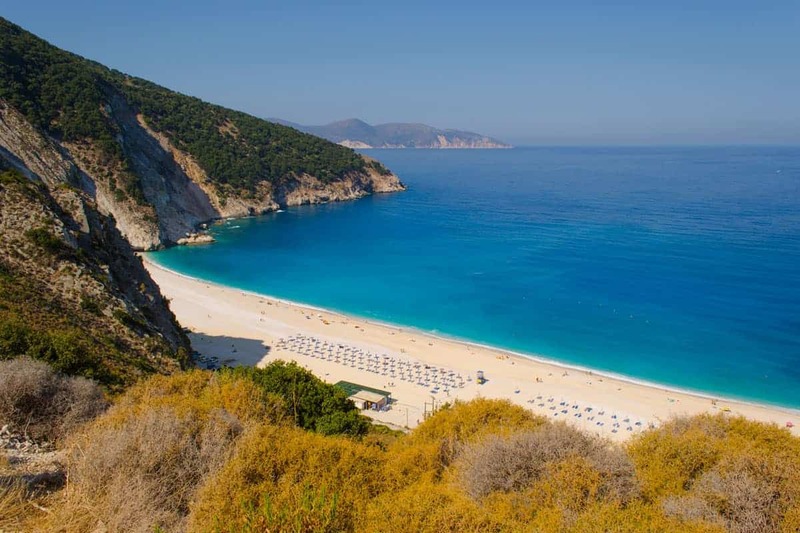 Myrtos beach is found on the west coast up towards the north of the island, it’s accessed via a steep, winding road and is well signposted. It’s advised to get there early as there’s only a small car park at the beach level, if you’re late you’ll end up having to park up the road and walk down or more importantly walk back up at the end of the day! 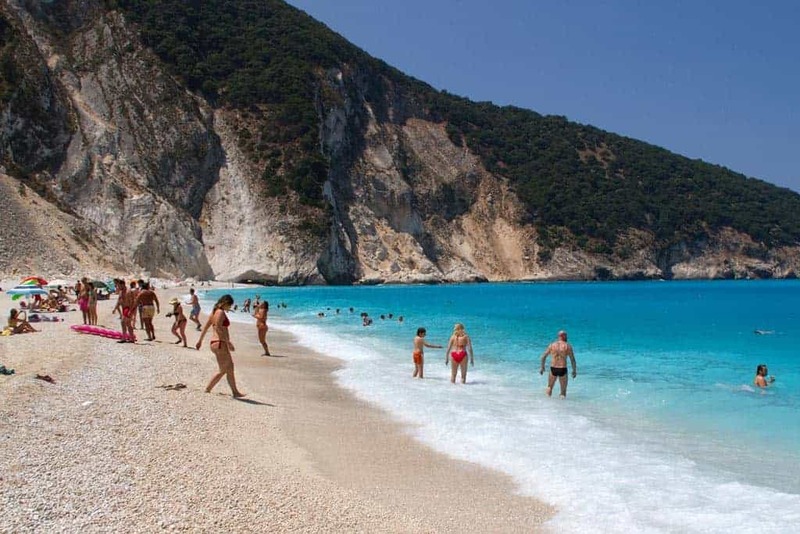 Myrtos beach is made up of white pebbles and gorgeous, crystal clear turquoise water. There used to be a couple of tavernas on the beach but they closed in around 2016, in 2018 a new taverna opened but it’s just for basic drinks and snacks. Sun loungers are now available again but not as many as before so probably best to bring everything you need with you just in case. There’s also no water sports or beach sports either so this is a beach that’s all about the scenery. There’s usually a fairly strong current and at times it can be pretty windy on the beach, this can make the entrance and exit from the sea a bit tricky especially if you struggle with the pebbles. For this reason we can’t recommend Myrtos for young kids or weak swimmers. If you have photos from Myrtos beach that you would like to share please use the form below to send them to us. Go to the Kefalonia resort guide to find out about the great towns and villages on the island. 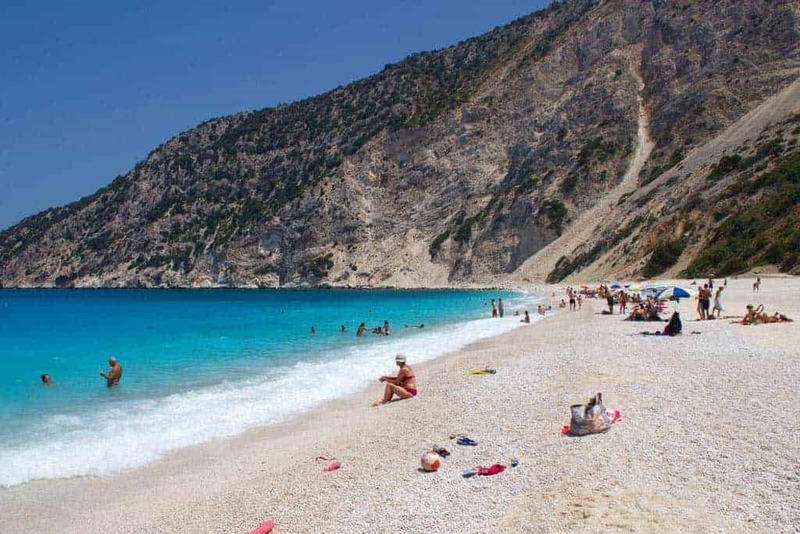 Go to the Kefalonia beach guide to find out about some of the best beaches on the island. Find something to keep you entertained whilst in Kefalonia with our Kefalonia sight seeing guide. Find information on another Greek island, whether that’s to hop from Kefalonia on a day trip or to research an alternative destination. If you’re going to Kefalonia or thinking about going then why not tell your friends about it using the links below? You never know what insights or advice they may have to offer. We want Which Greek Island to be as accurate and informative as possible, so, if you notice anything wrong with this listing about Myrtos beach or any other page please let us know. We’re also on the lookout for great photos to show people what the places we’re describing are like. If you have photos from Myrtos beach or from any of the other places on the site then we’d love to see them, simply click the button below to go to the photo upload page. Thanks.